So, remember last week when I told you CBS decided to swap the order of the fourth and fifth episodes, and how it didn’t seem like such a big deal? It’s kind of a big deal now. 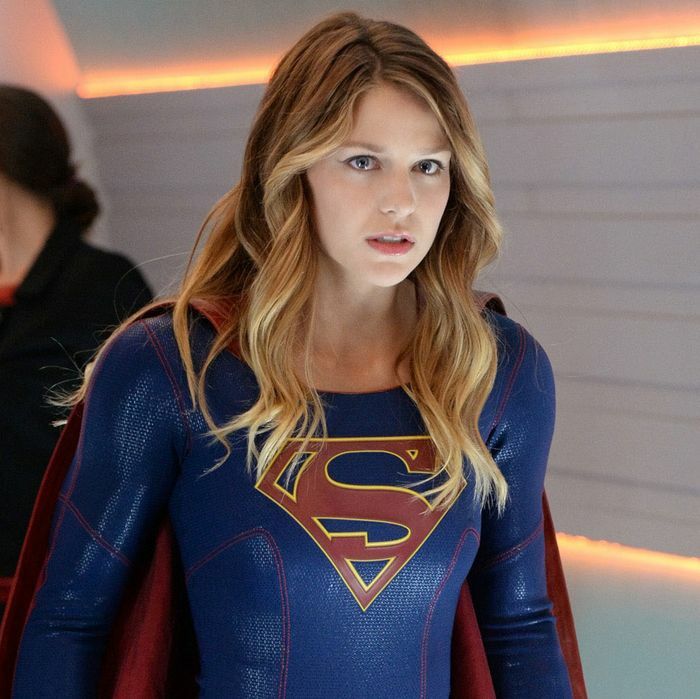 You can’t tell at first — the episode hits the ground running, with an impressive scene of Supergirl flying around National City before she spots and chases down a drone. Bringing it back to the DEO, she thinks it’s Henshaw keeping tabs on her, but it’s not. The tech belongs to National City’s own Elon Musk analogue, Maxwell Lord. Back at CatCo, Cat Grant has won the Seagull Prize for Women in Media, beating out Lois Lane for the very first time. But her nanny broke her legs and her mother, who seems as stubborn and selfish as Cat, will not help her watch her son Carter. So, Kara offers to babysit. Here is where the reversed episode order starts to mess with things — remember how James and Lucy Lane took off for Thanksgiving together? This episode is about how they made up after a rocking period following his move away from Metropolis. While it helps to fill in that particular plot hole, I wish it didn’t because it’s pretty terrible. It goes down the way Alex warns Kara about back at the DEO, after Kara tells her sister about James and Lucy: Kara tries too hard to be his friend and help him work out his feelings with Lucy, “spending more time in the friend zone than the phantom zone.” Of course, Kara doesn’t want or try to have things go this way — she just goes about it the wrong way, choosing to keep things strictly professional whenever James wants to talk about his feelings. She’s constitutionally incapable of telling him whenever Lucy is interested. It’s quite frustrating to watch and also quite silly to think about, especially because we know that James goes on to be more interested in talking with Kara over the phone while he’s off with Lucy. It feels like a needless complication where no one really learns anything. Anyway, there’s a plot in this thing. After getting picked up by Kara, Cat Grant’s son Carter hangs out at the CatCo offices while Alex investigates the scene at Lord Technologies. After a bomb following the drone is also tied to his company, Lord maintains that he’s being framed for something. Then, he flirts with Alex’s IQ when she displays knowledge of maglev trains — specifically, the one he developed and is about to launch on its inaugural trip later that night. Their conversation, however, is cut short when a bomb is found in Lord’s lab. Alex calls Kara to help dispose the bomb after Alex and Maxwell’s attempt to disarm it does that thing that happens in every damn movie and TV show, which is speed up. The bomb always speeds up. Kara flies it high into the atmosphere, but waits too long. The blast knocks her unconscious into the ocean. She wakes up in the DEO HQ, and through her semi-conscious haze she sees Hank doing the weird glowing-eyes thing he’s been doing all this time. Alex and Hank, meanwhile, have ID’d the bomber as disgruntled Lord Technologies employee Ethan Knox. Alex suggests that Kara ought to slow down, but she can’t — because she left Carter with Winn. (When he protests that he’s not good with kids, she responds, “You eat cereal for dinner and your desk is covered with toys.”) They’re just fine, though, playing video games on the myriad screens Cat uses to keep up with the news. Kara runs to get lunch at the bar/restaurant everyone seems to get everything from, and meets Lucy there. Lucy’s entire motivation for chasing after James essentially boils down to feeling like she took second place to Superman in Jimmy’s life. Now that he’s in National City and appearing on the news alongside Supergirl, she’s worried she’ll never stand a chance to get with him again. I don’t like Lucy Lane. I also don’t like Kara at this moment, because she goes on to tell James about Lucy’s feelings for him. Once she’s gone, Lucy visits to tell him she’s about to catch a flight back to Metropolis and that they both want what’s best for each other. Then, Lucy kisses him and yeah basically everyone is being super dumb here. Anyway, it’s the night of the maglev launch and Team Supergirl is on edge because the bomber is expected to strike, and he does — at the airport. James freaks out and heads that way, because Lucy isn’t answering her phone and he can’t warn her. Kara is initially on her way too, but a call from Winn pulls her away — Carter isn’t with him. Instead, he’s with Maxwell Lord, on the maglev train, because the news anchors suspected Supergirl would be there and Carter wanted to meet Supergirl. This would normally be a small mishap, if it weren’t for the fact that Ethan Knox is also on the maglev. So first, the airport. Lucy and James find each other and it’s a grand romantic gesture and I hate it. Alex and Hank find the airport bomb, but Hank tells Alex to evacuate with everyone else and uses his Mysterious Glowing Eyes to defuse it, then tells Alex it was a decoy. That problem is now solved, rather neatly. Less neat is the situation on the maglev. After introducing herself to Carter and blowing his prepubescent little mind, Kara gets all the passengers to the rear of the train and heads towards the front to confront Knox, who is wearing a suicide vest with a dead man’s trigger. She tries to talk him down, but it doesn’t work. He says he’s doing this to save his sick daughter — and then he arms the vest, giving Kara only 30 seconds to save the train. She separates his car from the rest, just watching as the front car motors on and Knox goes boom. I also hate this, because I feel like Kara could’ve done more. Back at the DEO, Alex talks to Kara about how the entire episode the decoy bomb from the airport doesn’t make any sense, because it’s constructed just like a real bomb. She’s also confused as to why anyone Knox did what he did, because killing himself seems like a lousy way to help his sick daughter. Over at CatCo, Cat Grant is back and glad Carter is safe and furious at Kara for the lousy job of babysitting she did and Kara asks her the question — “How do you do it?” And the scene turns into a grand meditation into whether or not a woman can have it all, which is apparently what this entire episode was about? This scene feels straight-up lifted from another episode entirely, and while maybe this theme might have gotten some lip service, there really isn’t a single meaningful plot beat dedicated towards exploring this idea other than the times where Supergirl has to fight crime and also remember to pick up her boss’s kid. But there is a bright spot, one that could’ve been brighter if everything just came together a bit better and wasn’t bogged down with a terribly forced love triangle and a shoehorned contemplation about the most tired question in all of feminism — and that’s Maxwell Lord. Kara figured out that he’s responsible for everything that happened today: He coerced Knox to perpetrate the bombings by paying for his daughter’s medical expenses and threatening to stop if Knox didn’t comply. The drones, the bombs, the train situation — all of it was orchestrated by Lord, just to see what Kara is capable of. It casts him as a charming, charismatic villain, a human big bad that can fight Supergirl in the open with his wealth and resources, a Lex Luthor of her very own. (He’s also got a bit of Tony Stark sprinkled in, just for good measure.) I’m looking forward to Lord’s villainy, and the ways he’ll try to make Kara’s life hell to figure out who she really is. I’m also looking forward to next week’s episode, which takes place after last week’s episode, which, you will recall, was a much better hour of television than this was. You can’t win ‘em all.